Welcome to Bryson Systems located in North Canton, Ohio. 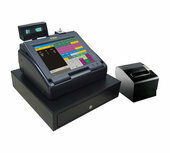 We sell, service and program Cash Registers/POS Systems. Over the years Omron, Casio, Kingtron, Samsung/Sam4s, QUORiON/OPTiMA, and PC America software. I began selling/programming electronic cash registers back in 1982. Omron was my favorite in those days.